From holiday roasting to just-because prime rib, this durable, must-have Anolon(r) Advanced Bronze Hard-Anodized Nonstick Roaster Set is designed for creativity in the kitchen(tm). Whether your roast of choice is turducken or turkey, free-range chicken or leg of lamb, this roaster set provides all the components for creative showcase entrees. The roaster features heavy-duty hard-anodized construction for exceptional kitchen performance from countertop prepping to stovetop gravy-making. The removable rack enables you to move roasts in and out of the pan with ease. Inside, triple-layer premium nonsticks keeps birds and meats from sticking when you turn or transfer them. 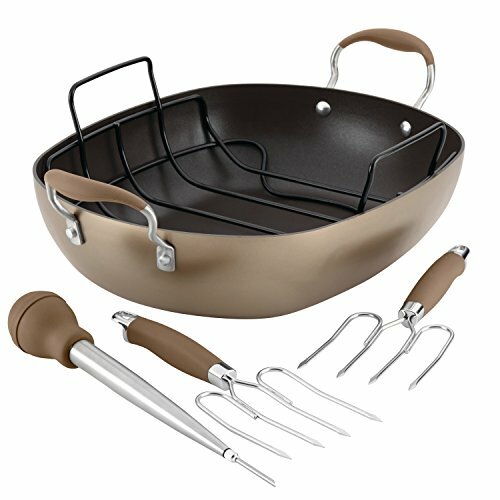 Outside, gorgeous bronze-tone nonstick promotes easy cleanup afterwards. A pair of sturdy SureGrip(r) stainless steel lifting forks makes moving roasts easier than ever, and the set includes a stainless steel baster with a heat-safe silicone bulb. Use the baster's removable needle to get those succulent drippings and marinades into hard-to-reach joints or to inject all those flavorful juices back into the meat. Because the quick, even-heating pan cooks beautifully, set the roasting pan on the stovetop to prepare pan sauces and gravies with confidence. Inside and out, the cookware's durable, premium-quality nonstick surface is metal utensil safe, with exceptional food release and easy cleanup. Oven safe to 400 DegreeF, the roaster's own dual-riveted Anolon(r) SureGrip(r) handles feature rubberized sleeves over stainless steel cores to provide reliable, comfortable handhold, even with bulky oven mitts. Discover the range of creative roast-making that is possible with the Anolon(r) Advanced Bronze Hard-Anodized Nonstick Roaster Set, and equip the kitchen in quality and style.